I need to apologize to my awesome CCC Fans. Why? Because I haven’t posted here in seven months. Would you believe me if I told you – life’s been busy? 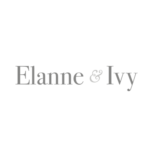 Two kids, a house full of pets a backyard full of chickens, and the owner of this business, food writing gigs on the side as well as Elanne & Ivy has left very little time for playing with food. Today, I decided to stop making excuses, and just post something already – so here I am! Ta-Da! 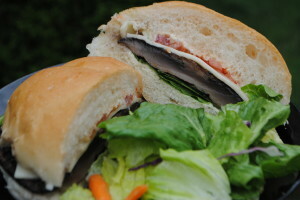 Today’s lunch was a fabulous Portobello Mushroom burger. It was simply delicious. Having switched back into the vegetarian lifestyle, I am always eager to find ways to make familiar meals into veggie alternatives that will appeal to everyone. Today, I did just that. 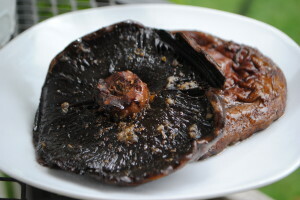 Portobello mushrooms are large and flavourful mushroom that hold their shape very well, and are easy to grill again because of their size and the fact that they don’t easily slip between the grill bars. They are very popular and easy to find in larger grocery stores. In this simple recipe, the mushrooms are marinated in oil with seasonings – that’s it! So easy, and nothing to it! Once mushrooms are washed, set them aside. In a medium bowl, combine the oil and spices and whisk together. Set the mushrooms on a large plate, and pour the oil over all of them, stem side up. Allow them to sit like this for about 15-20 minutes. Heat grill (either bbq or indoor) I use our Forman Grill. Grill the mushrooms flipping a few times during cooking so that they are well done. They will be done when they feel slightly soft, and have been grilled for about 15 minutes with obvious grill marks on both sides, but especially the tops. Serve on buns along with your favourite toppings – ours include mayo, lettuce, Swiss cheese, avocado & tomato.